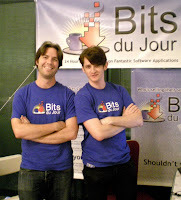 Nico and Roger hang out in the BitsDuJour exhibition booth on Friday night. We had a lot of familiar faces and some new ones stop by, a really great night. We had some tasty "bytes" on offer on the exhibition night too. Mike Dulin cracks jokes at the ASP Luncheon. Most of the e-commerce providers were on hand at the SIC this year. We caught up with the new e-commerce company UpClick. 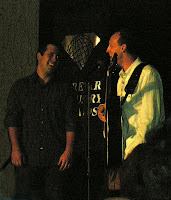 Rik Roberts shows how a real man should perform at the Shareware Industry Awards. Thanks for the information on the IT conference. The information which I have gathered from the conference helped me to get good job opportunity and to improve my skills.